Do you have a question about University history? Email it to rochrev@rochester.edu. Please put “Ask the Archivist” in the subject line. The small cyclotron, installed in Bausch & Lomb Hall, was designed and built by Professor Sidney Barnes. It had a 26-inch diameter and began operation in 1935. By the time you worked with it, the device had been converted by Professor Fulbright from its original purpose to a “variable energy machine.” It was shut down on October 11, 1965, and shipped one year later, as you recall, to India as a teaching tool at Kurukshetra University. Within a few years it was relocated to Chandigarh, where it continues to operate. The Tandem Van de Graaff accelerator built on the South Campus replaced that “baby” cyclotron as a research tool, producing 240 million electron volts to the latter’s seven. Nicknamed “the Emperor,” it was in operation from 1966 to 1995. 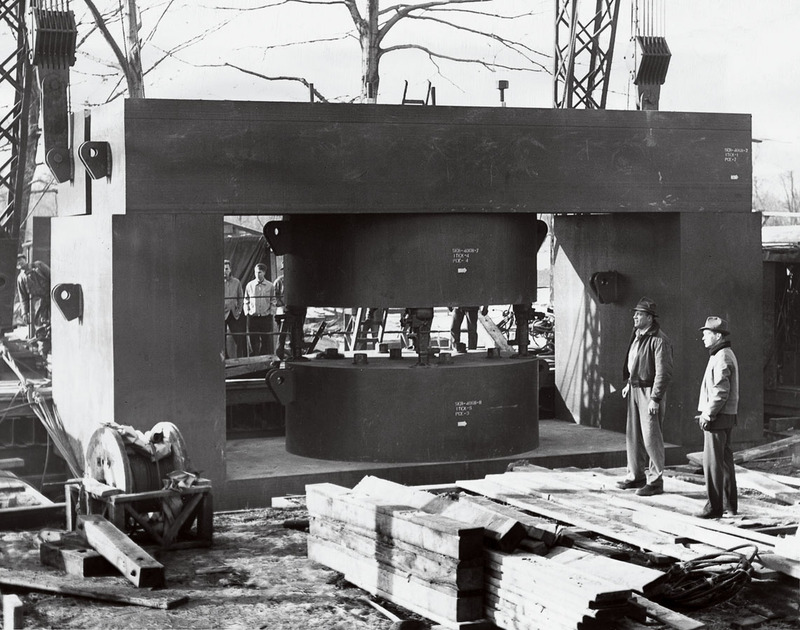 In 1946, pioneering physics professor Lee DuBridge initiated a project to create a new, larger cyclotron that would receive funding from the United States Navy for construction, while the operations were run and funded by the University. It would be located on the edge of campus, near the steam plant and the railroad tracks. 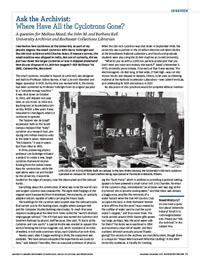 Everything about the construction of what was to be the world’s second-largest cyclotron was newsworthy. The eight steel forgings of the magnet were transported from Homestead, Pennsylvania, on specially adapted railcars capable of safely carrying the heavy loads. The buildings for the cyclotron were located near the railroad tracks that carried coal to the heating plant, roughly where Goergen Hall and the Computer Studies Building stand today. To reach that area required creating what the New York Times called the “world’s shortest single-gauge railroad.” The 473-foot spur was named the Cyclotron and Southern Railroad by physics staff because, they said, “It starts at the Cyclotron and runs south.” A special trestle was erected to support the work of winding the 64-ton magnetic coil, which consisted of 16 miles of welded, 4-inch wide aluminum strips, each 5/16ths of an inch thick. Twenty years after it began working in 1948, the equipment was outdated. “We have almost exhausted the experiments we could do here,” said Edward Thorndike, then an associate professor of physics. When the 130-inch cyclotron was shut down in September 1968, the University was a partner in the 33-billion-electron-volt (BeV) facility at the Brookhaven National Laboratory, and faculty and graduate students were also using the 10 BeV machine at Cornell University. “What do you do with a 2,000-ton particle accelerator that you don’t need any more and nobody else wants?” asked a November 5, 1970, University press release. It turned out that it was wanted. The electromagnet—26 feet long, 11 feet wide, 17 feet high—was cut into 40-ton blocks and shipped to Batavia, Illinois, to be used as shielding material at the National Accelerator Laboratory—now called FermiLab, and celebrating its 50th anniversary in 2017. No discussion of the cyclotrons would be complete without mentioning the “Duck Pond,” which in addition to providing a pastoral setting, appears to have powered a small rumor mill. Eric Chandler, foreman of the cyclotron shop, remembered “an artesian well was dug at the [cyclotron] site to provide cooling water,” and that there was already a boggy area, possibly the remnants of a water hazard when the Oak Hill Country Club occupied the land. A 1968 Rochester Review article affirms that the pond “was created by the outflow of water used to cool the accelerator’s magnet,” and thus never froze. The ducks arrived around 1950: Easter gifts grown too large, perhaps. Was the pond water safe for them? The ducks were examined in 1954 and received a clean bill of health. Did their numbers diminish annually around Thanksgiving? The records in the Archives are mercifully silent, though there is a recipe for “Roast Wild Duck with Wild Rice Stuffing” in the 1949 University cookbook, A Faculty for Cooking.